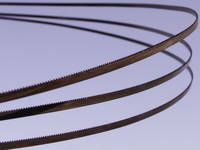 The high quality precision saw bands of the F-Series are best suited for hard materials like iron or cast products. The tooth density of 30 teeth/inch is particularly suitable for a material thickness between 1 to 5 mm. The type 518 F having 18 teeth/inch is particularly well suited for bigger dimensions and a high productivity. In addition we have bimetal and carbide as well as diamond impregnated saw bands in our manufacturing range.